In the over 20 years Royston Langdon has been making music, he has made it for himself and whatever band he has been in but has never crafted a tune for his own sake. This spring, Langdon, who will go under the moniker LEEDS, will release his solo debut, Everything's Dandy. 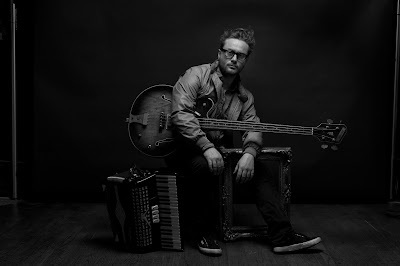 The former Spacehog frontman and Arckid member has been living in New York City for over 20 years and while he was born in Leeds, England, the Big Apple has been his home longer than many would imagine. He told Officially A Yuppie that the record is "not about NY anymore than any other of my records are. It's about where I am now, at the place I find myself. Wherever I go, there I am. It's a lateral look at myself within the city I suppose but it isn't about NY parse. If you listen to it, that will become obvious I think." Langdon aka LEEDS spoke to us about his new record, his former projects, and what it means to do it on his own. You are going under the moniker LEEDS as an homage to you hometown, why are you not using your name? It's not really an homage to my home town. It's more of an effort, and I recognize perhaps ironically, to avoid immediate association with my past. Also, 'LEEDS' is what I often find myself answering to the first or second question I'm asked once I've opened my mouth. 'Where you from?' Seems interesting to me that these are common conclusions being made here nevertheless. Do you intend to tour or have a full band with you at any point? I'd love to tour. Will have to wait and see if the music connects with people enough to initiate that sort of engagement. I think it would probably make most sense for me to tour solo at first, get the ball rolling. Ultimately though, the songs really do need to be performed with a band to make them come to life the way I made them on these recordings. The songs are so much more personal than anything you have ever written, what prompted you to craft this record after nearly 30 years in the music business? Thanks very much. That's always the goal for me. Being vulnerable isn't easy. Making music is ultimately compulsive for me. After a while of leaving it on the shelf so to speak, it starts to compel me to take it down and make something. It's a natural part of me. It would be a disservice to myself to avoid that indefinitely. It can comes at a high price though, to do it wholly. The big misconception many have about you is that Spacehog formed in the UK then once you broke big in the U.S. you stayed in the city but that wasn't the case at all. How did it all work out? I came to NY in '94, way before Spacehog, to visit my brother, Antony who'd been living in NY for a year at that time. I came for two weeks, for a holiday and to spend time with Ant. I fell in love with NY on the taxi ride from JFK. Two days before I'd arrived, Ant met a guy called, Jonny Cragg (a drummer from Leeds) who was working in a cafe on 2nd Ave in the East Village. Once here, Ant was very keen that I should stay and that we should start a band. At the time I was in another band in the UK. I was sort of fed up of music. My brother can be very persuasive and the truth was that my band in England was not that good. I stayed. Ant and I began auditioning drummers. Jonny was the second. He was the best I'd ever heard. Within a few weeks I'd gotten a lucky break by securing and internship at a recording studio, Baby Monster. I loved this job. I got to be around The Ramones, Dinosaur Jr. Sonic Youth, Pavement. Soon I was making a small wage. The real beauty was that I had access to the studio at night. I spent all my time there making songs after hours. So Spacehog was very much formed and then signed within NYC. Spacehog reunited in 2008, is there talks about a new album soon? I was never happy with our third record and so I wanted to go out with one that sounded improved. There are no plans to do anything in the future. One of my favorite projects you did was Arckid, I must have seen nearly every gig you did in NYC in your short run. What ever happened with that project and will the songs you released ever see the light of day? Could a reunion ever happen? Was bad enough been in Spacehog with one Langdon brother. Working with two brothers was like the musical equivalent of a freak yachting accident waiting to happen every minute. Volatile. There were some great songs though. And a great video for 'I'll Stick Around'. You have been in New York so long that it is certainly not the same city you arrived when you got here. What do you think of the change? Does New York City still excite you? NY's always been changing and it always will. Rapidly. In that sense it remains exciting and vital. The influx of global money especially from the finical sector has made the artist community suffer and diminish, certainly from how it was when I arrived in 1994. And so there are things that one misses of course, like certain places, some of the characters etc. that lack in that economy was paradoxically good for the economy of artists and art. Now, it's so much harder than ever to survive here as an artist. I do think NY will suffer a dilemma of identity within this paradox at some point. Though barring an Apocalyptic event, it will always remain one of the great social hubs of the planet. Aren't we humans physically social at heart? The latest collection of songs you kept private from many people, why was that? I was working on the business side of the music business. I wanted to keep the focus on helping other artists ford the many challenges of necessary change the internet heralded to the old form of the industry. However, it was useful to stay connected to my personal creative expression of choice, music but only for personal reasons, i.e. so that I could remain honest and fulfilled even within that less creative environment. Would have felt like a conflict of interests were I to be sharing my own work whilst working on behalf of other artists. I respect the art form too much to do that. After all these years making music and seeing the business and landscape change, is everything dandy? 'Everything's Dandy' is an effort to speak to our societal propensity towards upholding the 'dreamland' we've made. The fake version of society which is now impossible to see beyond. I wanted to express the beyond, for me personally. I've been through a lot. I've been forced to change or die. I've had to let go of a hell of a lot. People, places, things. My dreams. Innocent dreams of being in bands. The broken dreams of my family life. The idealized dream of my country subjugated by a Wall Street Government. The American dream. There's sorrow there but in a way that's also still just old joy. There's a deeper peace in the acceptance of that. What IS is now, and that's way more fulfillment than I've ever known and so yes, everything is looking dandy. It's wonderful to be in this position I am with my insights I have at my age. I've still so much to do and so little time. What advice do you have for any up and coming artist today?